I guess somebody out there got really miffed (which is not surprising because the government as defined by political parties is usually to 'represent' masses (to get votes) and if the masses are nutcases then the government will be representing nutcases - a kind of a circular reference or a Catch -22, for progressive minded sane people) with how the bureaucracy and the government works, who keep blaming each other or asking for newer things; much like how the traffic cops usually know how to ask for docs that you don’t have and at times for bribes, for which you do not have the money! With JsDom, it is similar. JsDom requires a particular version of NodeJS. Cool, so you get the latest version or upgrade with npm, right? Wrong. 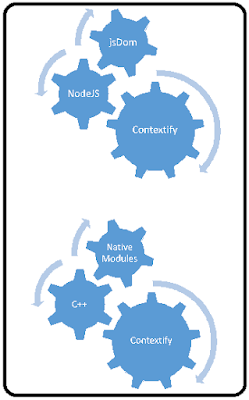 Because NodeJS simply refuses to respond until you nativize your Contextify. But, why do you want to Contextify, in the first place? You don’t but you have to because you want to use JsDom. But why do you want JsDom? Because you want to jQuerify. But why do you want to jQuerify in NodeJS if you can simply use jQuery? Because you want to jQuerify and Ajaxify the scripts in your HTML DOM so that you could trick the user into believing that you are using a server while using a browser but which in turn is false because it turns out that it is not a trick because even a browser is not used. And to do all these Trickifys, you need your native IDEs like Visual Studio or xCode because you cannot compile native modules as they are machine specific! Much like how nutcases who believe that you cannot survive by doing everything on your own without their help (imagine Nuttifys to make believe the nutcases to believe that they are not nutcases and you get the picture!). Or, in much clearer terms, it is how some nutcases want to 'liaise' with you to fix a marriage or even a job interview for another while being already married. So why should the nutcases do so? Because...dash it, that is why they are nutcases, I can't possibly answer every question in this world, can I? Do some homework on your own.